St. Peter Chanel parishioner Joseph Faletra of Scout Troop 1134 completed a Respect Life project to earn his Eagle Scout rank. SNELLVILLE—Two Catholic young men earned the Eagle Scout, the highest rank awarded by the Boy Scouts of America. Their service projects helped a parish and monastery. Jerry C. Baker III, who goes by Chad, a member of Troop 598 in Sugar Hill, recently completed his Boy Scout Eagle service project at the Monastery of the Visitation in Snellville. It involved building a new sign on the grounds, replacing one approaching 50 years old. 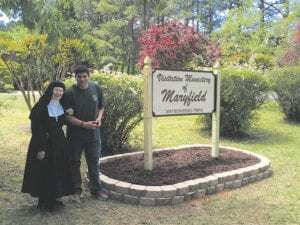 Mother Jane Frances Williams of the Monastery of the Visitation in Snellville, the superior of the cloistered monastery, stands with Chad Baker, Eagle Scout, who provided the monastery with a new sign as part of his Eagle Scout project. The sign was one part of a project that also involved cleaning and revitalizing a large area at the rear of the monastery’s property. Along with his father and several other men from St. Lawrence Church, Lawrenceville, Baker has helped the religious community with grass-cutting, brush-clearing, edging, weed-pulling and any assistance they may need since he was about 8 years old. He is the son of Charity and Jerry C. Baker II. The family attended St. Lawrence for years and recently started to attend St. Anna Church, Monroe. St. Peter Chanel parishioner Joseph Faletra of Scout Troop 1134 recently completed his Respect Life project to earn Eagle Scout status. He managed the construction of 100 white painted crosses for the Respect Life Ministry’s “Cemetery of the Innocents” at St. Peter Chanel Church. The crosses are erected every January at Blessed Trinity High School in Roswell to commemorate the millions of American babies lost through abortion since the Supreme Court legalized abortion in 1973. His effort raised more money than necessary for the project. The additional money will assist women in need through St. Peter Chanel’s Respect Life program. Joseph is the son of Pam and Steve Faletra of Woodstock.